A pool in Jerusalem. According to John v. 2—the only passage wherein it is mentioned—it was "by the sheep market," hence on the north of the Temple-hill. Its exact location can not be definitely fixed. The Pilgrim of Bordeaux (about 333) and also Eusebius ("Onomasticon," cclx., ed. Lagarde) describe it as a double pond with reddish water, surrounded by five colonnades. Hence it might be identified with the two ponds below the convent of the Sisters of Zion. 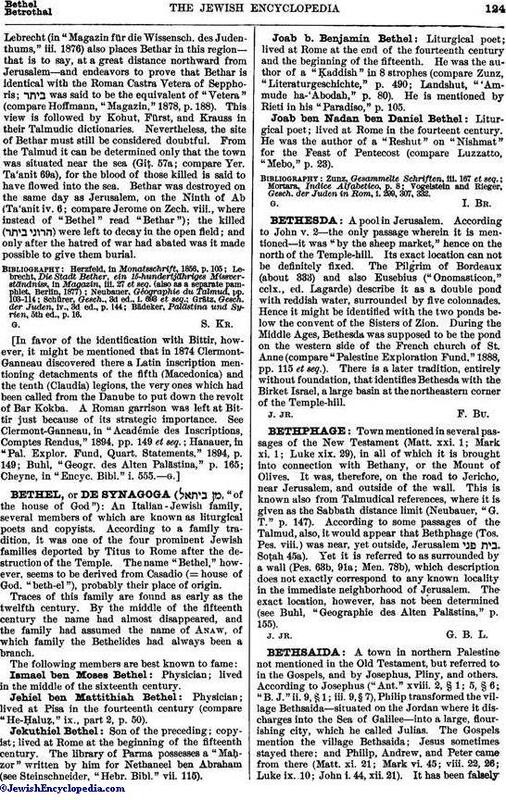 During the Middle Ages, Bethesda was supposed to be the pond on the western side of the French church of St. Anne (compare "Palestine Exploration Fund," 1888, pp. 115 et seq.). There is a later tradition, entirely without foundation, that identifies Bethesda with the Birket Israel, a large basin at the northeastern corner of the Temple-hill.